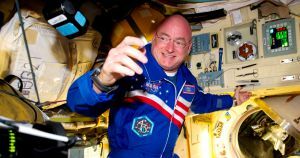 Former NASA astronaut Scott Kelly announced Tuesday that he’s running for Senate in Arizona — and he’s positioning himself as a defender of science during an era when it’s under threat. Kelly is a highly accomplished astronaut — he flew four space shuttle missions and spent nearly a year in space so that NASA could compare his DNA to that of his Earth-bound identical twin brother. Back on Earth, Kelly hopes to win the seat of John McCain, the long-serving Arizona senator who died in 2018. Unlike McCain, Kelly is running as a Democrat. Kelly is presenting himself as a problem solver who weighs evidence and resists special interests. It’s an approach befitting an accomplished engineer and astronaut, but also one likely to ruffle feathers in D.C., according to Kelly. “Our fight to improve our gun laws and my commitment to tackling climate change and ending the outrageous influence corporate money has on our politics means there are a lot of powerful interests who want to stop us,” he wrote in an email to supporters. The post NASA Astronaut Runs for Senate, Warns Of “Retreat From Science” appeared first on Futurism.